Danish poet; born Aug. 25, 1798, at Copenhagen; died there Feb. 25, 1870. He studied law at the University of Copenhagen, but, soon renouncing it, he devoted himself to literature. In 1832 he embraced Christianity. 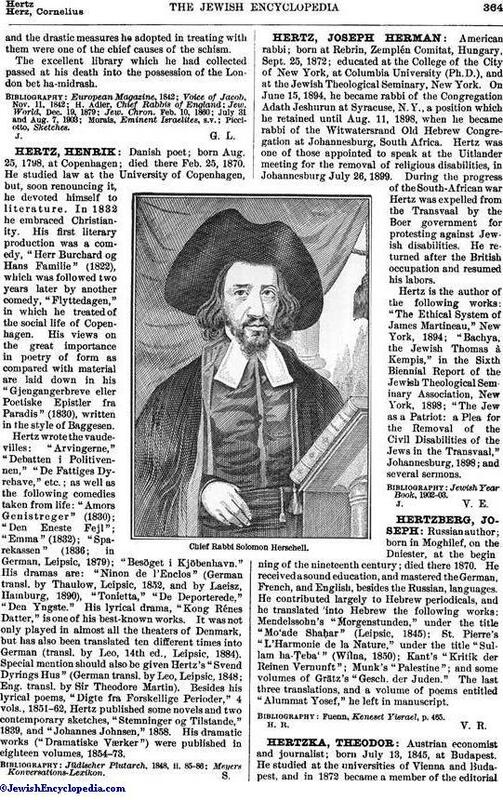 His first literary production was a comedy, "Herr Burchard og Hans Familie" (1822), which was followed two years later by another comedy, "Flyttedagen," in which he treated of the social life of Copenhagen. His views on the great importance in poetry of form as compared with material are laid down in his "Gjengangerbreve eller Poetiske Epistler fra Paradis" (1830), written in the style of Baggesen. Hertz wrote the vaudevilles: "Arvingerne," "Debatten i Politivennen," "De Fattiges Dyrehave," etc. ; as well as the following comedies taken from life: "Amors Genistreger" (1830); "Den Eneste Fejl"; "Emma" (1832); "Sparekassen" (1836; in German, Leipsic, 1879); "Besöget i Kjöbenhavn." His dramas are: "Ninon de l'Enclos" (German transl. by Thaulow, Leipsic, 1852, and by Laeisz, Hamburg, 1890), "Tonietta," "De Deporterede," "Den Yngste." His lyrical drama, "Kong Rénes Datter," is one of his best-known works. It was not only played in almost all the theaters of Denmark, but has also been translated ten different times into German (transl. by Leo, 14th ed., Leipsic, 1884). Special mention should also be given Hertz's "Svend Dyrings Hus" (German transl. by Leo, Leipsic, 1848; Eng. transl. by Sir Theodore Martin). Besides his lyrical poems, "Digte fra Forskellige Perioder," 4 vols., 1851-62, Hertz published some novels and two contemporary sketches, "Stemninger og Tilstande," 1839, and "Johannes Johnsen," 1858. His dramatic works ("Dramatiske Værker") were published in eighteen volumes, 1854-73.